This holiday season we are supporting three wonderful ways to give back in our community. The cold weather is here! Please consider donating a warm winter coat to our coat drive. Coats and jackets should be clean and gently used. The goal of One Warm Coat is to provide any person in need with a warm coat, free of charge. Carly has a collection box in her office, or feel free to leave them with security. Coats will be collected until February 1, 2011. The Alameda County food donation barrel is in the main lobby. Last year the Breuner Building collected about 350 lbs. – about 270 meals for local folks. Let’s top last year! The food bin will be located in the main lobby through the first week of January. 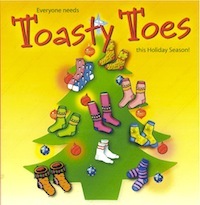 Our neighbors at the Insight Center for Community Economic Development, Suite 815, are hosting a Toasty Toes sock drive to benefit a woman's shelter – A Friendly Manor. Please deliver new adult and youth sock donations directly to Suite 815; they have a box in their front lobby and will collect socks up until December 17, 2011.